His last command was to go and make disciples. His last words here on earth were "and you shall be my witnesses, both in Jerusalem, and Judaea, and Samaria, and unto the uttermost parts of the earth," Acts 1:8 Using concentric circles, we can visualize the need to first begin winning those closest to us in our community (Jerusalem). Then we can reach others through our region (Judaea). Then we should stretch our outreach into the nation (Samaria). Finally, we should be involved in worldwide missions to globally reach the lost. The problem is that most Christians have never heard the "Macedonia call," - "come over and help us." We are often too busy with our own challenges. Once we develop a personal mission plan, we will better fulfill the Great Commission to go into all the world and make disciples. It all begins in our homes, then spreads out inviting people to our church to hear the gospel. Then it stretches into our communities where we become "messengers" of God's love and forgiveness, and eventually we go, give and / or pray for a lost and dying world without Christ. 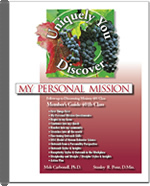 The My Personal Mission Profile Member's Guide, Facilitator's Manual and PowerPoint Presentation are designed to train your members in the "how to" practical steps. It is an innovative and enlightening way of teaching evangelism and discipleship from a fresh biblical Human Behavior Science perspective. Your members will learn how to put feet on their faith. The My Missionality resources are a must for every church interested in building disciples who will magnify God.